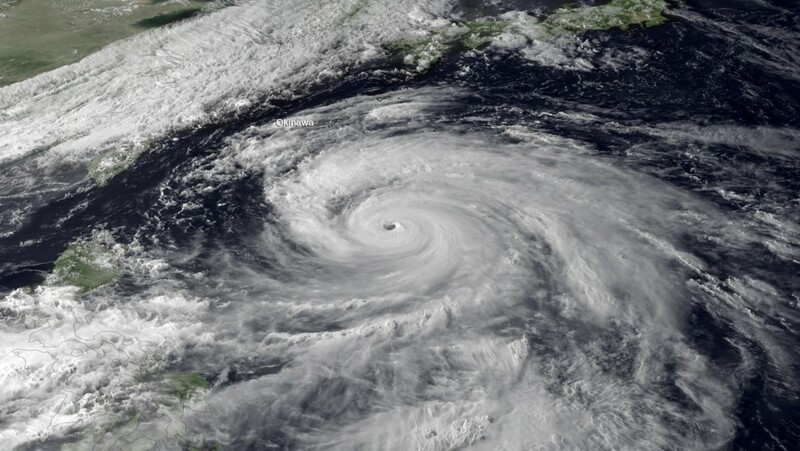 Typhoon Sanba--and what is a "super typhoon"? 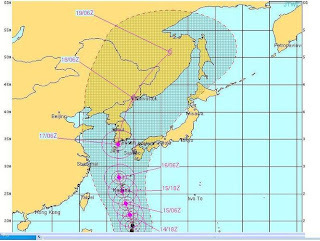 Typhoon Sanba is churning away in the Phillippine Sea, having hit Okinawa and moving north toward South Korea and, eventually, China. Sanba can't be aware of it, but it's got two friends in the eastern Pacific--Kristy and Lane-- and one in the Atlantic--Nadine--that NOAA is keeping track of. Sanba is going to encounter warm water for the first half of its trip between Okinawa and South Korea, but cooler water on the second half. That should at least be some help in moderating its intensity before it strikes South Korea, but it is still expected to be severe. China is already calling on residents to prepare for the storm. The possibility of landslides looms large there. Sanba has been called (briefly) a super-typhoon. In a previous post, I discussed super-typhoon Tracy, which was so large that it would have covered the whole western half of the U.S. Sanba, like Tracy, is a huge storm. 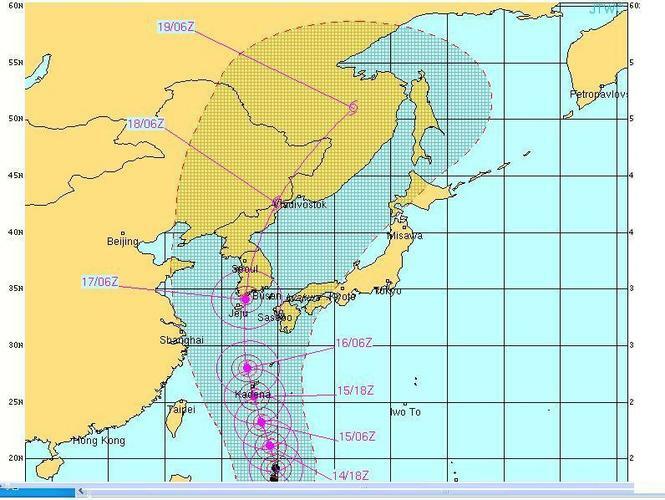 Projected trajectory for Sanba. NOAA image. However, sheer size doesn't make a super-typhoon. To be officially a super-typhoon, a cyclonic (rotating) storm must have winds that reach "maximum sustained 1-minute surface winds" of at least 150 miles per hour (65 m/s, 130 knots). It is the equivalent of a strong category 4, or category 5, hurricane in the Atlantic on the Saffir-Simpson scale, or a category 5 "severe tropical cyclone" in the Australian basin. As an example, super-typhoon Pongsona that hit Guam in 2002 had gusts to 173 mph, and sustained winds of 144 mph. This storm also was huge, with an eye almost 40 miles in diameter. A blog that I really enjoy is by Cliff Mass, a meteorologist, on the weather, climate, and meteorology of the Pacific Northwest. There is a really great discussion today (September 12, 2012) of mirages and the atmospheric conditions that produce them. Check it out! 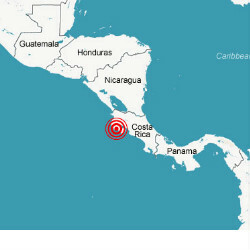 At 8:42 a.m. today, a magnitude 7.6 earthquake struck offshore 88 miles from San Jose, the capital of Costa Rica. It was located at 40 km (25 miles) depth. A tsunami alert has been sent out for the Pacific coasts of Central and South America. Here is a link to the USGS description of the tectonic setting of the quake. Officials can now issue a preliminary estimate of tsunami danger in less than an hour after a quake. During this hour after an earthquake, scientists are searching for four pieces of information that determine the likelihood of a tsunami: the geometry of the fault motion, the energy and depth of the earthquake, and the depth of water over the fault rupture zone. Some earthquakes produce tsunamis, others do not. Earthquakes in which the dominant motion is lateral, so-called “strike-slip” like that on much of the San Andreas fault in California, do not generate tsunamis. They form, rather, during quakes in which rocks have some vertical motion along a fault, causing a bulge or depression to form in the water. Such quakes, known as “tsunamigenic” earthquakes, occur in the subduction zones of plate tectonics—primarily those bordering the Pacific Rim, where two thirds of all tsunamis occur, but also in the Indian Ocean, the Caribbean, and the Mediterranean. During the Tohoku earthquake, an area of nearly six thousand square miles--the size of Connecticut--thrust up as much fifteen feet, disturbing an enormous volume of water. Oceanographers need to know the depth of the ocean over the rupture zone because the more water above the displaced crust, the more water that moves out into the tsunami. The energy of an earthquake and the process of transmitting the energy to the water are both related to the area of the displaced ground and how far it moves during the quake, its displacement. Both of these quantities are captured by the seismic moment, a quantity that is related to the Richter magnitude. This relation of magnitude to area and displacement of the crust is the reason that estimates of the magnitude of the earthquake are so important in prediction of the size of a tsunami. Boxers understand this piston physics well—a big fist thrown in a long punch is more powerful than a small fist with a short reach. The potential for devastation by a tsunami depends on the fault geometry in one another way. Waves from a fault rupture are bigger in some directions than in others. Waves spreading away from the long sides of a rupture--that is, spreading perpendicular to the fault plane--tend to be much bigger than those that spread away from the tips of the fault, parallel to the fault plane. If two coastlines are at equal distances from a fault, the one perpendicular to it is more likely to experience damage than the one parallel to it. Because of this geometric effect, Bangladesh—though lying nearly at sea level—was spared much devastation from the Sumatra earthquake. The depth of an earthquake matters because a tsunami is only produced if the sea floor moves into the overlying ocean. If the earthquake is buried too deep in the crust, the fault that caused it may never break through to the sea floor or, if it does, may be moving too sluggishly to give the water a good punch. Shallow earthquakes with substantial vertical displacements and high moment magnitudes generate the largest tsunamis. The depth of water over the displaced crust matters because it, along with the area of the displaced crust, determines the initial volume of water displaced and able to move into the tsunami. 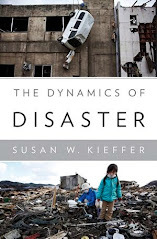 **This is an excerpt from my forthcoming book "The Dynamics of Disaster", due out summer 2013 from Norton Press. It can be preordered from Amazon.com here.